Usually we reserve lettuce wraps for a Chinese style ground beef or turkey mixture. However, we had some lettuce, and I decided that scrambled egg wraps might be tasty. 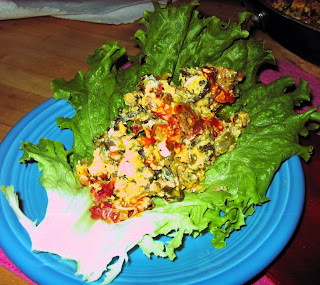 I chopped up some of the leftover spinach and mustard green mixture, added a few eggs, scrambled and topped with hot sauce. We had a bunch of baby artichokes from our CSA box and I thought they would be great for breakfast with some tender poached eggs. I was right. They were delicious. Sautee the onions and garlic in a bit of olive oil. Add the artichokes and about 1/2 cup of water and cover. Simmer for a few minutes, until artichoke hearts are fork tender. Then sautee, uncovered, until all liquid is evaporated. Season with salt and pepper and serve with a couple poached eggs. We were having dinner with our friends B and V the other night when we mentioned that we had never eaten at Google's famed cafeteria. Since V works at the Google office in SF, she graciously offered to host us for lunch. 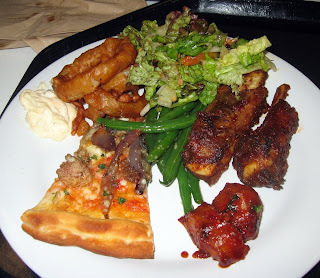 The food was pretty darn good and there was a great variety. The day we were there, the theme was "beer". Pork Sausage Pizza (tasty with a nice, crisp crust), Beer Battered Onion Rings with Mayo (not to crunchy, actually), Composed Salad with Apricots (flavorful and fresh), Garlic Green Beans (fresh and garlicky), BBQ Ribs (tender and flavorful), "Hippy Nuggets" (these were spicy chunks of sunchokes and they were quite delicious). A bit fishy, but good. Totally delicious and very smooth. 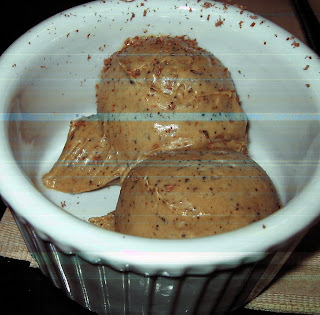 A perfect portion of sweet, coffee mousse. A great way to end a meal. This was sort of a thrown together meal in which I just grabbed things from the fridge, but it turned out alright. I think the key is that if you add cheese to anything, it immediately tastes better. 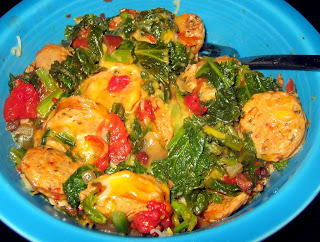 Sautee the onions and the mustard greens together, then add the sausage and the tomatoes. When most of the liquid has evaporated, add the cheese and serve. I'm always trying to think of good uses for the rotisserie chicken from Costco, which has to be the best $6 deal around. 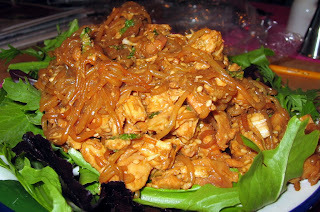 This time, I chopped up the chicken and made and Asian-style peanut salad with noodles. 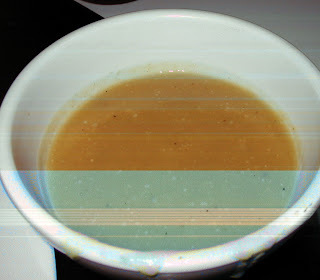 Combine all of the liquids and the sesame seeds to make a sauce. Mix the sauce into the chicken, onion and noodles. Serve over a bed of mixed greens. Not terrible, just very ordinary. Quick and easy. This pork chop was rubbed with coriander, salt and pepper, then pan fried on all sides until done. The salad was simply dressed in a homemade vinaigrette. 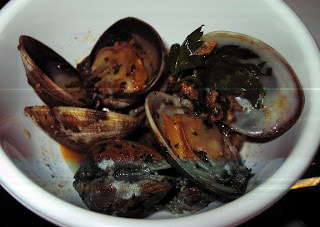 We kept hearing that Oliveto was such a gem of the East Bay. So, when we were looking at a house near College Avenue in Rockridge we decided to try it out. Granted, we ate lunch in the cafe downstairs (because that is what is open on the weekend), but we were not impressed. 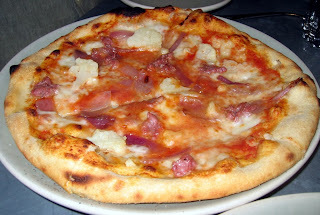 There wasn't a whole lot of choice (sandwiches and pizza were pretty much it) and the execution was not great either. This was ok, if a little bland. 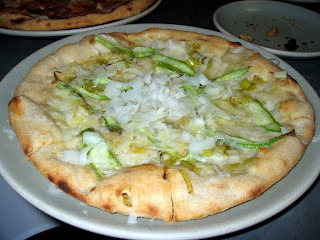 This was one just plain soggy, although the flavors were nice.